Observed on a clean install bare-bone Jenkins 1.636. Issue present also after update to 1.637. 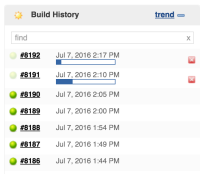 On a properly working Jenkins, issue becomes present after upgrading from 1.620 to 1.637. Known previous version without the problem (might not be the last one): 1.620. Java: OpenJDK 1.8.0.67 on RHEL-6 x86_62, build provided by OS vendor. Jenkisn runs directly (service jenkins start) and is accessed directly (no reverse proxy). Browsers: Firefox 41, Chrome 46. Observed on a clean install bare-bone Jenkins 1.636. Issue present also after update to 1.637. On a properly working Jenkins, issue becomes present after upgrading from 1.620 to 1.637. Known previous version without the problem (might not be the last one): 1.620. Java: OpenJDK 1.8.0.67 on RHEL-6 x86_62, build provided by OS vendor. Jenkins is installed from Jenkins RHEl repo at http://pkg.jenkins-ci.org/redhat Jenkisn runs directly (service jenkins start) and is accessed directly (no reverse proxy). Browsers: Firefox 41, Chrome 46. Job status is not updated in the web browser during build. The progress bar appears and the dot starts blinking, but they never move - even when the job is finished. Reloading the page shows proper status (if job is completed) or proper progress (if it is still building). Problem observed with latest Firefox and Chrome (other browsers not checked). Inspecting AJAX calls in browser's console reveals that AJAX requests are sent each few seconds and all get 200 OK, but the response body is empty. (On a properly working system the response body is not empty while the job is building). jenkins.log shows no error or exception - in fact even at log level 7, it shows nothing about the AJAX call. It just denotes at INFO level that a job is starting, then that it completes. Matthew Reiter Could you submit this as a PR on GitHub? Daniel Beck added a comment - 2016-09-09 22:20 Matthew Reiter Could you submit this as a PR on GitHub? 1) The next build number being fetched wasn't taking into account running builds, so any builds already running when the page is refreshed would be ignored. The fix was to use nextBuildNumberToFetch if it is available (which is the case if there are running builds) and to fall back to the next build otherwise. 2) The first transient build key (used to clear out builds from the history that are being updated) wasn't being set when the page first loads. This was fixed by making getHistoryPageFilter calculate the value so that it happens in all cases rather than just during the ajax call. SCM/JIRA link daemon added a comment - 2016-09-18 04:52 Code changed in jenkins User: Matthew Reiter Path: core/src/main/java/hudson/widgets/BuildHistoryWidget.java core/src/main/java/hudson/widgets/HistoryWidget.java core/src/main/resources/hudson/widgets/HistoryWidget/index.jelly http://jenkins-ci.org/commit/jenkins/0268b988d5c88cd29be12ed25e95d5bc448c2840 Log: [FIXED JENKINS-31487] (#2542) There were two issues preventing the build history from updating properly: 1) The next build number being fetched wasn't taking into account running builds, so any builds already running when the page is refreshed would be ignored. The fix was to use nextBuildNumberToFetch if it is available (which is the case if there are running builds) and to fall back to the next build otherwise. 2) The first transient build key (used to clear out builds from the history that are being updated) wasn't being set when the page first loads. This was fixed by making getHistoryPageFilter calculate the value so that it happens in all cases rather than just during the ajax call. Is there any chance of getting this fix into the 1.x version? Kevin Mandeville added a comment - 2016-10-10 21:48 Is there any chance of getting this fix into the 1.x version? We are no longer maintaining any releases of the 1.x line. Regular weekly releases are at 2.25, LTS releases are at 2.19.x. Daniel Beck added a comment - 2016-10-11 06:07 Is there any chance of getting this fix into the 1.x version? We are no longer maintaining any releases of the 1.x line. Regular weekly releases are at 2.25, LTS releases are at 2.19.x.